Ayurveda, the science of life and longevity, is the oldest healthcare system in the world and it combines the profound thoughts of medicine and philosophy. 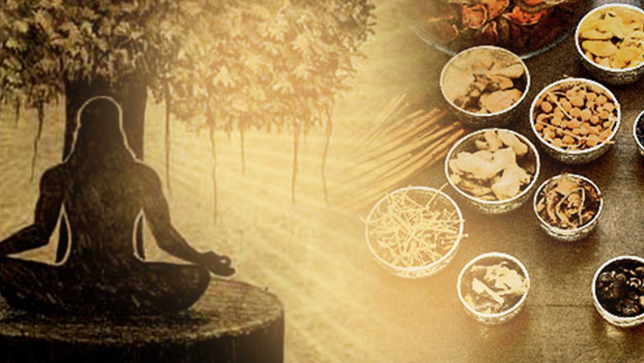 Since then Ayurveda has stood for the wholesome physical, mental and spiritual growth of humanity around the world. Today, it’s a unique, indispensable branch of medicine, a complete naturalistic system that depends on the diagnosis of your body’s humours – vata, pitta and kapha – to achieve the right balance. In essence, Ayurvedic treatment is concerned with the prevention of ailments. The curing of ailment is of secondary importance. According to Ayurveda, illness occurs when any one or more of Tridoshas (Vata, Pitta, and Kapha) makes imbalanced or erratic function which results in the malfunctioning of the internal organs. Air, Water, Fire, Earth and Ether, the five basic elements of the universe, have also to work in cohesion to have the human body the required elements for strength in addition to Tridoshas, according to Ayurveda. Ayurveda originated in India around 5000 years ago. Centuries back Ayurveda was the main medical stream practiced in India. In Kerala, Ayurveda continued to thrive over the centuries – because of the land’s geographical isolation -even as its fortunes declined across India. 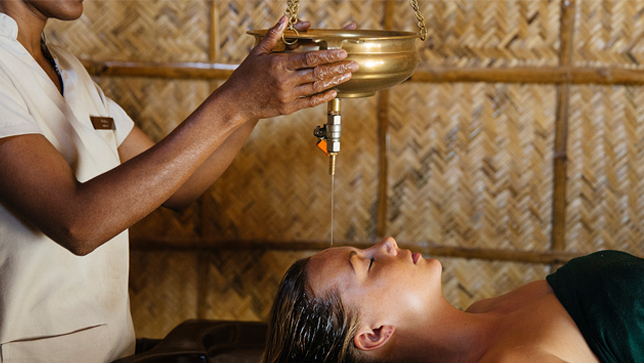 Kerala is the paradise of Ayurveda. No country in the world can claim parity with Kerala in Ayurveda. Kerala is blessed with a good climate, and an abundance of natural herbs that makes it the best place to enjoy a rejuvenating Ayurvedic therapy session. For rejuvenation therapy the ideal time in Kerala is monsoon (June to November). The cool and rainy atmosphere forces the body to open its pores to the maximum when herbal oils penetrate to the body quickly to have optimum result. The temperature during the monsoon season is relatively even during the day and night and so stresses the body very little. Furthermore the rain draws the dust out of the air which is also beneficial during the treatment. Around four million people are coming to India every year for Ayurveda treatment. People from all over the world come to Kerala in search of Ayurveda treatment – either for rejuvenation or to find a cure. The ideal climate, blessed landscape with forests and mountains are ideal to grow herbs and medicinal plants on their own. Adequate infrastructure facilities with enough highly qualified and experienced Ayurveda Physicians are the reason for the development of Ayurveda treatments in Kerala. For hundreds of years the Ayurveda Vaidyas (traditional practitioners of Ayurveda) were almost the only access for people seeking healing from every kind of disease in Kerala. The Vaidyas (traditional practitioners) – especially the legendary Ashtavaidyas renowned for their magical healing touch -played a key role in strengthening the tradition of Ayurveda in the State. The Ashtavaidyas and their successors treated the entire state for centuries. Being the only resort of treatment for the people, the Vaidyas of Kerala were challenged to interpret the theories of Ayurveda and adapt them actively into effective healing systems in everyday life. Thus almost all the contemporary procedures and protocols of Ayurveda have evolved in and around Kerala. In Kerala Ayurveda is not just a healthcare system but it is a part of every aspect of life, in fact it is a lifestyle in Kerala. Ashtavaidyas, traditional physicians who are experts in the eight branches of Ayurveda, as laid out in Ashtangahridayam, have contributed much to Kerala’s rise as a prominent centre for Ayurveda. The unique Ashtavaidya tradition is said to have evolved as a result of the centuries-old interaction between text-based Ayurveda practices and regional folk medical practices utilizing Kerala’s rich medicinal flora. Of the original 18 Ashtavaidya families, a few still remain in practice in the State. Kerala’s deeply-rooted Sanskrit heritage was another significant factor that led to the land’s supremacy in this natural system of science. In fact, Ashtangahridayam, the treatise on Ayurveda is widely used in Kerala – its verses familiar even to the common man. Selected few Brahmin households, named generally as Ashtavaidyas, were responsible for maintaining the Ayurvedic tradition by practicing it as a health care service as well as by teaching its principles in the unique gurukula tradition. The traditional practitioners of Ayurveda considered Ashtangahridaya as a primary text. Several commentaries were written by experts here. More importantly, new texts were written in Kerala both in Malayalam and Sanskrit. Sahasrayogam, Chikilsamanjari, Vaidyamanorama are just a few examples. These and similar other Kerala texts still remain sources of very useful information on formulation, medicinal plants and therapies. The single drug remedies or Ottamoolichikitsa of Kerala Vaidyas does wonders even in many chronic ailments. Another very important contribution by Kerala physicians is the continued practice and enrichment of the panchakarma therapy. Even when they became dormant in the rest of the country due to socio-political reasons, Kerala retained this therapeutic wealth in all its essence. As the practice of Ayurveda expanded in popular acceptance in the recent past, the panchakarma treatment modalities have also become more prevalent. Ayurveda is not just a system of medicine. It is indeed a science and a way of life. Ayurveda briefly explains the knowledge of the dos and don’ts one has to follow, which favors the well-being of each individual to lead a healthy, happy and comfortable life, both physically and mentally. It also emphasizes that prevention is better than cure. If you are looking for Ayurveda treatments and Ayurveda courses Kerala, contact Greens Ayurveda right away. Call us at +91 496 2504334 now! !